In an exciting new collaboration, Volvo is partnering with the Sydney Institute of Marine Science (SIMS), Fibercon and Reef Design Lab, to put tiles onto a seawall in Sydney Harbour to help biodiversity. The research is a green engineering initiative of SIMS' World Harbour Project, and is led by Associate Professor Melanie Bishop of Macquarie University. As coasts have become more urbanised coastal environments are gradually being built over. Seawalls are the dominant feature of many urbanised NSW coasts and typically support lower biodiversity relative to the natural habitats they replace. Maria Vozzo, a research associate with SIMS explains that “We’re looking at retrofitting seawalls with habitat forming tiles to try to make them more ecologically friendly and more complex to support native marine biodiversity.” The walls will attract a wider range of native Sydney rock oysters, limpets, snails, starfish, anemones, kelp and other seaweeds, and at high tide, fish. 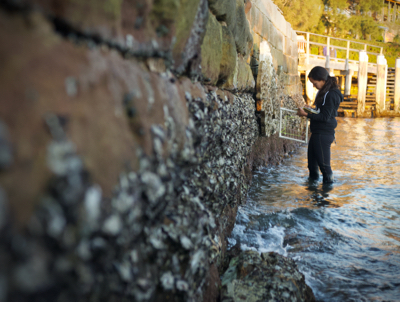 SIMS' Associate Professor Melanie Bishop of Macquarie University is leading the project to investigate the effectiveness of enhancing native biodiversity at the scale of whole seawalls.